Text ganz oben (falls abweichend vom Muster)? 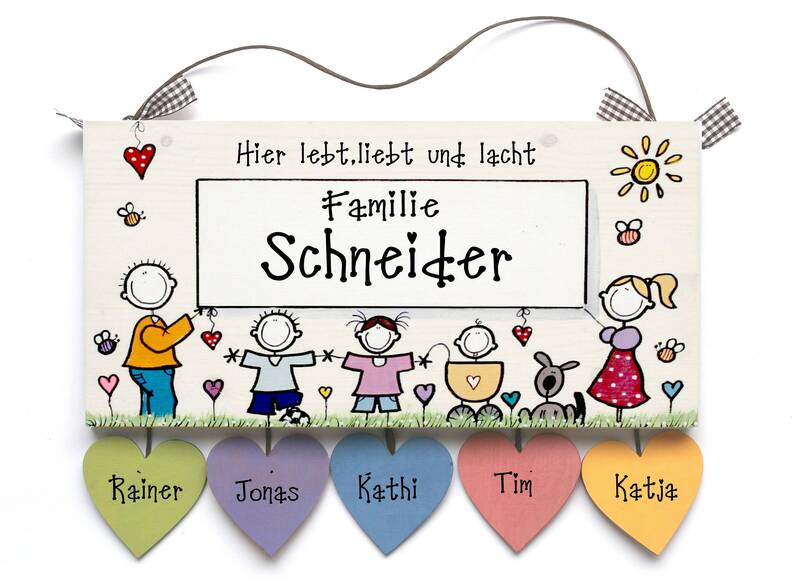 Door Sign Wood (Spruce 18 mm) with up to 5 heart pendants and suspension with Karoschleiferl. The choice of characters and font is up to you... Selection tables can be found in the product photos. With this door sign we labeled "Here lives, loves and laughs", including "family" + Wish name. Parents are placed on the left and right side, children + pets in between. The hearts (maximum 5 pieces) are primed in the desired colour and labelled with the first names. As always, special requests will be met. Please note that the adults are placed left and right outside, in submitting the design requests please tell who is adult, who is child. Sehr netter und freundliche Kontakt. Superschönes Türschild, meine Wünsche sind toll umgesetzt.